A small upright evergreen shrubby plant with fine hairy foliage, Erica cerinthoides is known as the Red Hairy Heath. Flowering from mid winter to spring depending on the climate, the brilliant red flowers are the main attraction, although the foliage also adds interest year round. The flowers appear on the terminal foliage spikes and are covered with fine hairs. This is a species that naturally occurs in the South Africa and is widely spread. Varying in height and in flower colour this is one of the most popular of all of the Ericas. White and pink flowering varieties can be found however the red variety is most common. Best in an open sunny position in an area where winter rainfall is good. It is a plant that requires excellent drainage. Once established E. cerinthoides is fairly hardy and can survive hot periods in summer, as long as the soil around is well mulched and the root run remains cool with some moisture. Add some extra compost to the soil to help with moisture retention. Use a low nitrogen fertiliser in spring to promote good growth. 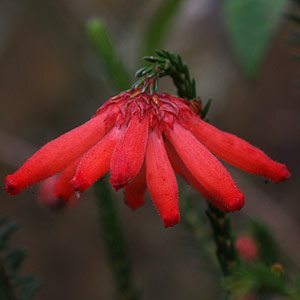 Also known as the ‘Fire Heath’, and this is not because of the fiery red flowers, it is the rootstock that will regenerate after fires that gives it this name. A pink flowering variety is also available. A little light pruning immediately after flowering will help keep the plant a little more compact. Height – Generally less than 1m in height. Position – Full sun is essential for good growth and flowers. Flowers – Red in winter to spring. A pink variety is also available. 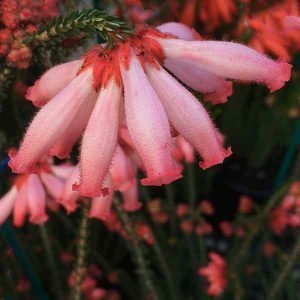 Erica cerinthoides is available for sale from the following retail nurseries. – Usually in late winter to early spring when in flower. Good range of, Fruit Trees, Roses, Trees, Shrubs, Perennials and annuals. Includes Avocados for cold climates, persimmon and Olives.